In the early 90’s, diver and traveler John Beernaerts used a table mat to sketch out his brainchild for a friend during dinner, a marvelous pool for training divers that would be first-rate, so much so that it would recreate the conditions of Bora Bora. Beernaerts recognized the vast difference between learning to dive in the blue lagoons of the exotic island regions and learning in a dirty, shallow pool in the city of Brussels. He wanted to instill an immediate love of diving in those who did not have the option of traveling to some far off vacation spot to enjoy the underwater world, so he brought an underwater world to Belgium, by creating Nemo 33. 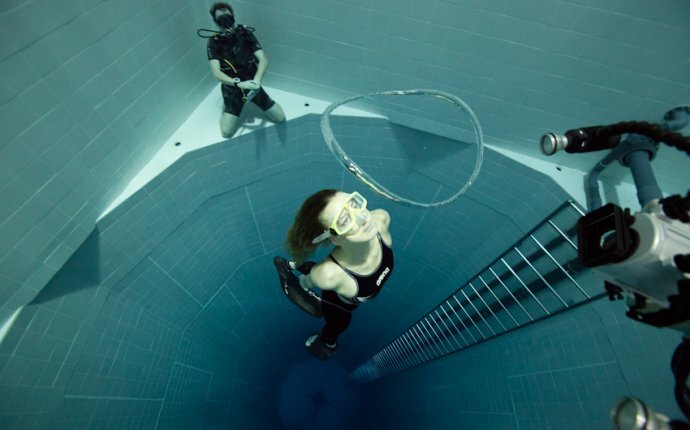 Its deepest level reaching 113 feet down, Nemo 33 is the deepest indoor swimming pool in the world. With simulated caves, several platforms and the 33 meter deep cylindrical pit, Nemo 33 provides a place for novices and veteran divers to learn and enjoy themselves in a clean and exciting environment. While it still isn’t Bora Bora, the facility is extravagant and multi-purpose, used for recreation, several different diving instruction packages, military training, and film production. Various underwater windows allow visitors to peer through the 2.5 million liters of highly filtered spring water and watch the divers as they swim about at different depths. The facility is open to the public, as long as you meet the requirements and pay the entrance fee.